Branding your Teaching Materials – Learn, Canva. Creating your own teaching brand simply means spreading the word about what you’re already doing: helping students learn in your own unique way. So how do you do it? By building a visual identity which you can use to attract interested viewers and promote, market, and sell your teaching materials. The same general branding guidelines apply to most professional areas, including teaching. You need a clear and memorable message, or “brand story”; a visual identity which includes a logo, color and typography scheme, supporting graphics, and presentation style; a well-defined mood or tone; and, of course, the number one requirement of all--you guessed it--consistency across all these areas. We’ll show you how to take care of all these things with Canva. What’s the overarching theme of your teaching style? Do you integrate technology into everything you do? Do you advocate for active rather than passive learning? Collaborative learning? Flipped learning? BYOD? Are you an expert organizer and want to make life easier for teachers who struggle to stay on top of everything while finding time to pause for breath? Building a brand means having a story to tell and letting that shine through everything you do. You want viewers to get to know you as quickly as possible, so be sure you’ve identified your core teaching values before you start organizing your teaching materials into a shareable product. Spend some time identifying your theme by clearly defining who you are and what you do as a teacher. Brainstorm some ideas in a mock About Me page. You can use one of Canva’s resume templates like this Pastel Pink and Blue Modern template to get started. Design a logo to go with your materials. It should be clear and simple yet stand out from the rest. It should also be uncomplicated enough that you can resize it and add it to your social media posts, graphics, and other materials. A logo helps viewers recognize your brand quickly, whether it’s fellow teachers browsing through materials on TeachersPayTeachers or surfing through their social media feed. Canva has an entire section of graphics devoted to logos, so you can adapt an existing one to suit your branding needs or start from scratch with your own text holder, color scheme, and font. Be sure that the design of your logo will resonate with your target audience. 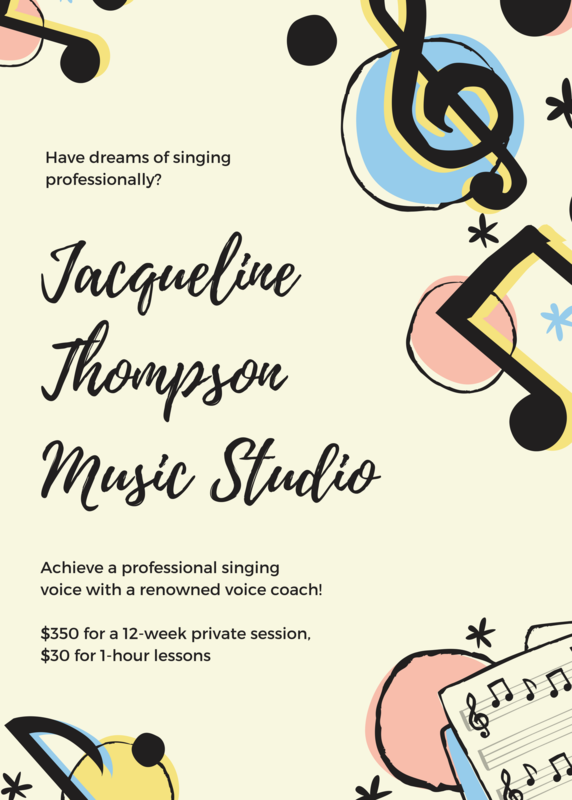 If that audience is teachers or parents, your look will probably be on the fun and cheerful side; if the audience is adults signing up for your workshop or course, it will be on the more professional side. Draw some inspiration from this Hand drawn Circle Logo. With the handwritten-style font and emotional message, it’s a good example of a logo that speaks to fellow teachers and puts the cause of education right up front. Do you want bright and bold, pastel, cool? Choose a color scheme that reflects the spirit of your course or workshop. If you’re lecturing about the Psychology of Happiness, you probably don’t want your course materials to be blue or dark in tone. Red is often associated with urgency and alarm, so that may not be the best color to draw viewers in. While different color schemes may apply to different subjects, your font should generally stay the same across all materials. Just as people associate consistent grammar and punctuation with being more detail oriented and therefore more reliable, your audience will take you more seriously and grasp your message more easily if your typography is consistent. Keep in mind that it can be counterproductive to use a font or color scheme that stands out too much. You want the font to be readable and the colors to enhance, not overwhelm, your product. Experiment with different color schemes and fonts with this Art Workshop template. You can check out a guide to creating effective color-font combinations here. Aim for consistency with your graphics as well. For example, although it’s perfectly acceptable to combine photos and illustrations within a single graphic, you may want to avoid mixing different types of graphics when presenting your product. If you’re promoting a series of online courses, for instance, make sure the accompanying graphics are consistent, e.g. either photos or illustrations. Canva’s graphics tool can be used to both create and enhance your teaching materials. You’ll find templates for lesson plans, presentations, portfolios, flash cards, infographics, and more. If you’d simply like to spice up what you’ve already got, you can create graphics or use images to add to your existing materials. Creating graphics is one of the best ways to establish and share your brand. And don’t think that a “fixed” brand means you’re pigeonholing yourself: you can grow your business or online presence simply by reproducing different kinds of content in the same style that viewers have come to recognize. 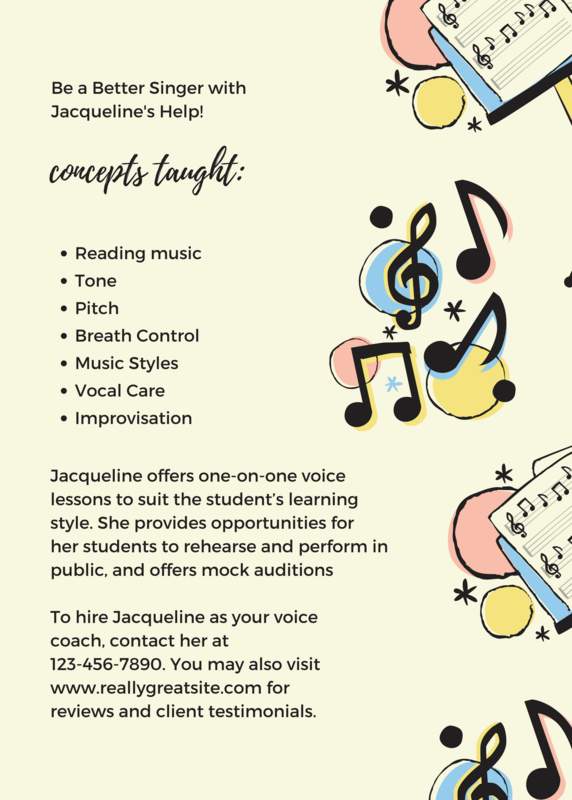 Create a unique graphic to advertise your product with a template like this Beige Musical Notes Illustration Tutor Flyer. Consistency is not only in appearance but also in the writing style, message, and presentation of your product. Start by determining who your target audience is. Parents? Students? Other teachers? Adults looking to further their education? The tone will not be the same for all of these, as different audiences respond to different tones. For instance, if you’re targeting students, you’ll want to focus on how your materials will help them learn more efficiently: your content should focus on empowering students through quality education. If you’re targeting teachers, you’ll want to focus on how your materials will help them teach more effectively: your content should focus on streamlining quality instruction. Create a flyer that sums up the tone of your product, almost like a “thesis statement” in the form of a graphic. This will help you determine the kind of mood you’re going for and the audience you’re trying to reach. You can then reuse it later as a promotional tool. 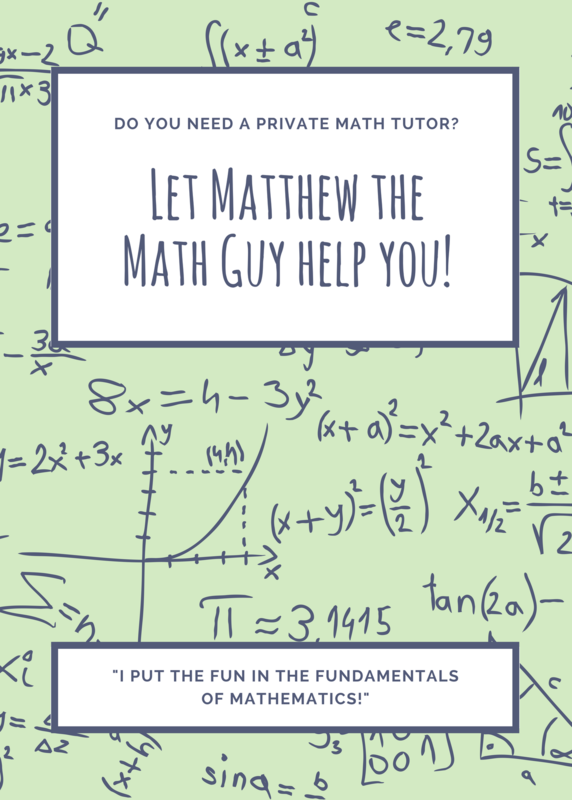 Get started with this Green and Blue Illustrated Math Solutions Tutor Flyer. 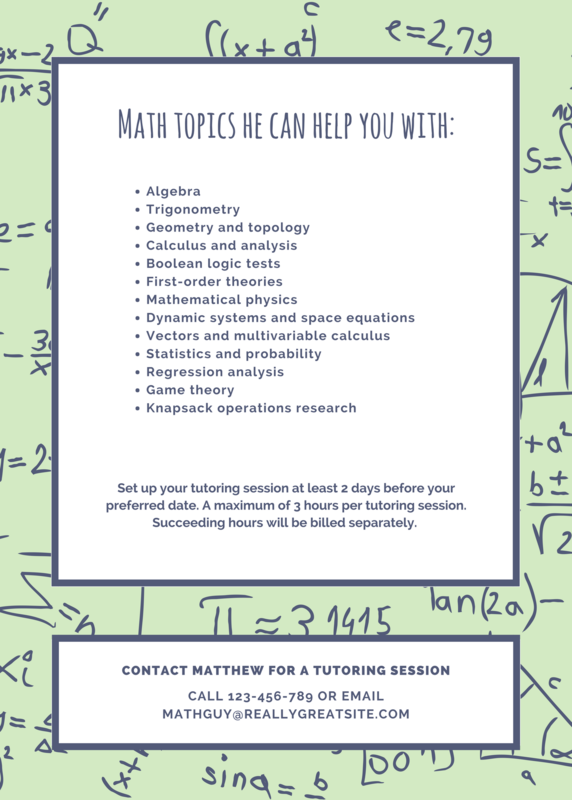 The pastel color and feverishly scribbled notes in the background suggest that learning math can be easy and fun. The tone of the text is friendly and inviting. There’s no mistaking that students are the target audience. Branding encompasses not only the way you design your product but also the way you present it. Consider the layout of your platform and the way your materials are organized. Start by asking yourself what you want your audience to do, and in what order. Do you want them to get to know you and your story first? View a snapshot of a workshop or talk you’ve given? See your materials right up front, or once they’ve browsed your blog a little? If you’ve got a pop-up email subscription box or ads on your website, how quickly do you want viewers to see it? Consider how presentation style can invite or distance your viewers, especially if you’re selling your materials. Also bear in mind that viewers will come to expect the kind of delivery you establish in your first round of materials, so be sure to achieve the right presentation from the start. Use Canva’s presentation mode to design a layout that reflects your vision, message, and personality. The most literal understanding of branding is the physical kind, as in putting a recognizable stamp on your product. Why not apply a similar concept to your teaching materials? The more often viewers see your logo (without going overboard), the more it reinforces your brand. In fact, the “Rule of 7” states that it takes most people seven encounters with a product to respond to it, so let your brand do the work for you! Once you design and save your logo, you can resize and overlay it onto any graphics or educational materials you create. It’s a subtle way to achieve that Rule of 7 without hitting viewers over the head with it. It also adds an official, professional touch to your product and helps viewers associate your brand--and therefore you--with the level of quality they receive. People want to know exactly what they’re signing up for before they commit. Give them a sneak peak of your course (also known as a “hook”) in the form of a video or presentation. Offer freebies and giveaway materials so that viewers can familiarize themselves with your product. Free materials are also more likely to be distributed and shared by viewers within their wider network, which means more people will be drawn back to your platform. Don’t be afraid to give away your materials--spreading your brand around a bit will be worth it in the end. If you’re targeting students, offer a free “sit in” on part of a workshop you’re giving. If you’re reaching out to educators, use your social networks to message teachers and offer free samples of lesson plans or tutorials. Your social media presence is an integral part of your teaching brand. All of your course materials should display your social media contact information. That means you should build up these channels well in advance of launching your materials. You can even customize your social media icons to match your brand. Social media channels like Pinterest, Twitter, and Facebook help you reach viewers and help viewers reach you. They also reinforce your brand. Viewers will take you more seriously if you have a wider presence on the Web, since it means you have value across multiple modes and platforms. It’s like proving you can pull off several fashion trends at once. Another important part of your brand is “social proof,” which means reinforcing your core values by including reviews of your course or product. This could be in the form of a quote from a client, statistics on course participation, or a review system on your web page. Use Canva’s social graphics resources to create your own social media brand. Check out this Website Launch Rocketship Facebook Cover Photo for inspiration. Lastly, design your distribution and communication strategies. Your distribution channels are a big part of your brand. How will you get your message out into the world in a way that feels consistent with your story? Many teachers sell their materials in an online marketplace like TeachersPayTeachers because they identify with the “teacher as expert” cause behind it. You’ll want to design a communication strategy that fits your brand by reflecting your personality: Do you communicate primarily through email? Social media? Your personal blog newsletter? Keep the communication consistent just like the other parts of your brand. Canva has a variety of Media Kit templates that can be used as Teaching Material portfolios to organize your materials into a shareable format. This Simple White and Mint with Grunge Texture Media Kit illustrates how to create such a portfolio. Branding your teaching materials isn’t as hard as it may sound. In fact, it’s more like taking one of those personality tests we all find so irresistible and applying the results to your daily work. If you can explain how you teach and what you believe in as an educator, you’ll be well on your way to creating a unique brand for yourself. The most important rule of thumb is to keep your style clear and consistent throughout the creation, presentation, and distribution of your materials. Have fun with it and enjoy watching your audience grow as you leverage that authentic voice.